Dar es Salaam — Egypt president Abdel Fattah Al-Sisi arrives at the Julius Nyerere International Airport to start his two day state visit. Mr El-Sisi is received by his host President John Magufuli.he is in the country on the invitation of President John Magufuli. The tour according to the Permanent secretary at the ministry of foreign affairs and international cooperation Dr Aziz Mlima aims strengthening the cooperation the two countries relations. 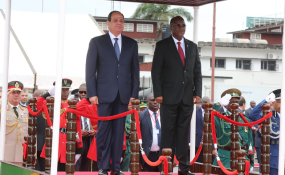 President Al Sisi is expected to hold talks with President Magufuli. President Magufuli will also host state banquet for his guest at the State House.